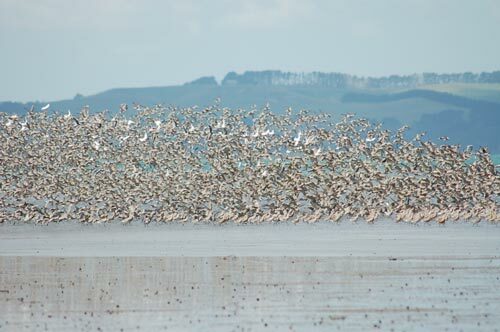 Wading birds feed at Manukapua on the Kaipara Harbour. The harbour is an important habitat for both native and migratory birds. Each year thousands of birds arrive from as far away as Siberia and Alaska – flying 7,000 kilometres or more. They need to double their body weight if they are to complete their return journey, and the mudflats are a rich source of crabs, marine worms, and shellfish. Still, their habitat is under threat from recreational vehicles, dogs and people, and the birds have abandoned some areas of the harbour.